That’s where Timothy is right now. It was a bumpy week, but in the end it went just as we hoped it would. We wanted him to stay healthy enough to have surgery, and he did. We prayed that the surgeries would go well and they certainly did. Our surgeon predicted that it would take 2 days for T to poop, and it did. Our nurses told us that the first day after surgery would be tough, and it was. And we hoped we’d be back home eating Davanni’s pizza together tonight and we got our wish. Actually, Timothy almost got paroled from the hospital yesterday, but he lost his mojo a little. After some initial success with his bodily functions, the 16 pounder pulled to the side of the road and stopped putting out dirty diapers for a few hours. That’s not a great idea when your body’s just been given a tsunami of liquid food. Fortunately, nature won out last night and he checked off his three boxes — Poop, Pee and Cool – and returned home this morning. 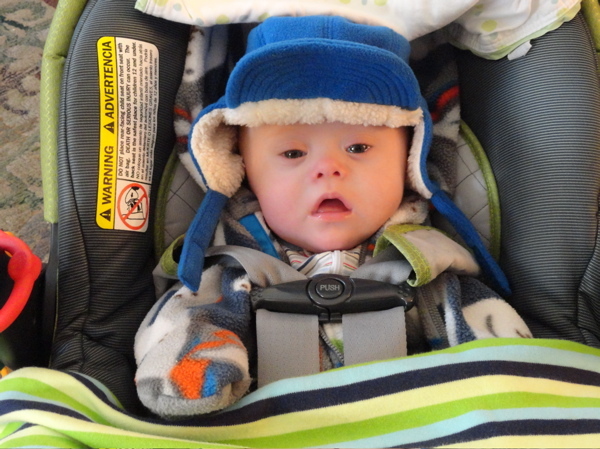 He’s happy to be home, but is still adjusting to a world without wires or feeding tubes, and is not yet 100%. He’s currently drinking watered down formula (which is to formula what 3-2 beer is to regular beer), and is spitting up sometimes, and so we just need to be patient with his feedings. On the brink of Oscar season, it is appropriate that Timothy played many parts this week, from the baby girl in 3121 to Incredible Hulk tearing out his tubes and arm restraints and now back to now portraying himself. This kid has such range that his little white tape mustache made him a dead ringer for the dapper snowman narrator in the classic Holiday cartoon ‘Rudolph the Reindeer’. A friend looked at me funny when I mentioned that Timothy was having surgery on both his ears and his colon, and I was tempted to say that we had a BOGO (Buy One Get One free) coupon for an extra surgical procedure on the refrigerator and decided to use it. But actually, it’s pretty common for kids to couple ear tubes when having another surgery. Timothy’s Special Education yoda, Jan Fritze, suggested that we have a TRBL party. Well, all of you are invited to join us as part of Team TRBL to do the Polar Bear plunge on Mar 3rd at Lake Calhoun in Minneapolis. This is a very fun fundraiser for Special Olympics, which does great work for kids with disabilities. Afterwards, we’ll have a little party for boy TRBL. We’re just getting started, but our age range right now is from 8 years old to 47, and we’d like to widen it. Timothy will definitely be there to cheer on and maybe taunt his team. Regardless of whether or not you come to the plunge, all of you are invited to a little after party, where you can see young Timothy. It’ll be a lot of fun. On a final note, I’ve had some people tell me almost apologetically that they read the TRBL blog, like they weren’t invited. Here’s the deal – everyone’s welcome. As long you don’t mind my sense of humor or Timothy’s piling up dirty diapers, feel free to read on. We’ll try to keep these going weekly or so.